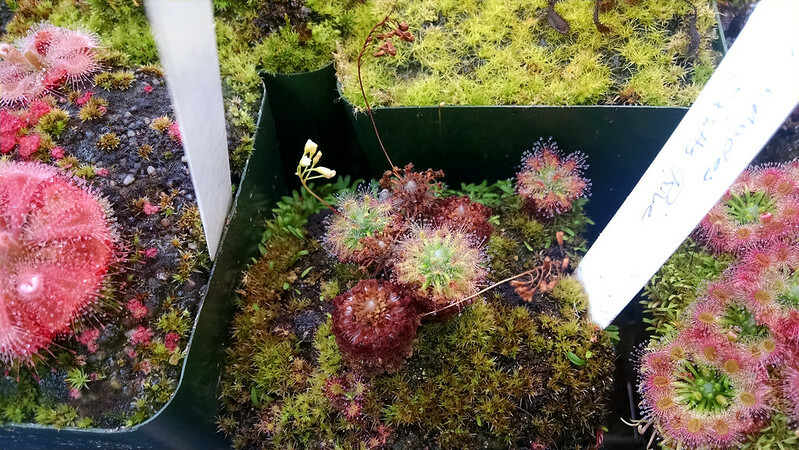 Pygmy sundew roundup, April 2015 |Sundews Etc. 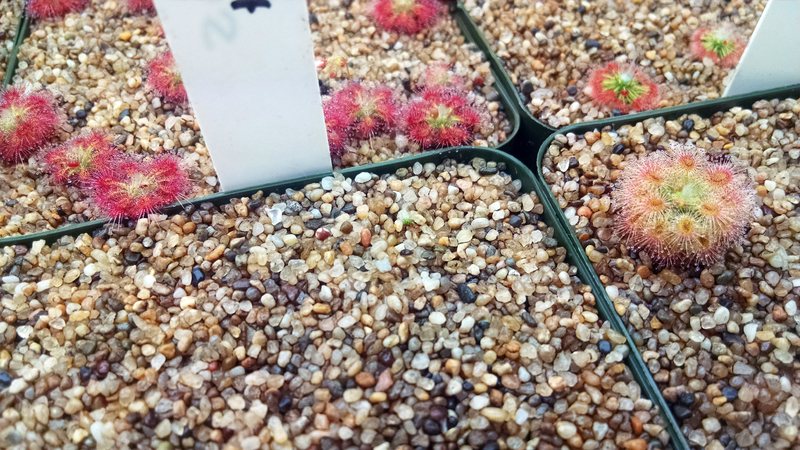 It's been a while since I did a pygmy roundup, and lots has been going on, so I decided to check in on the cutest little plants in the collection. 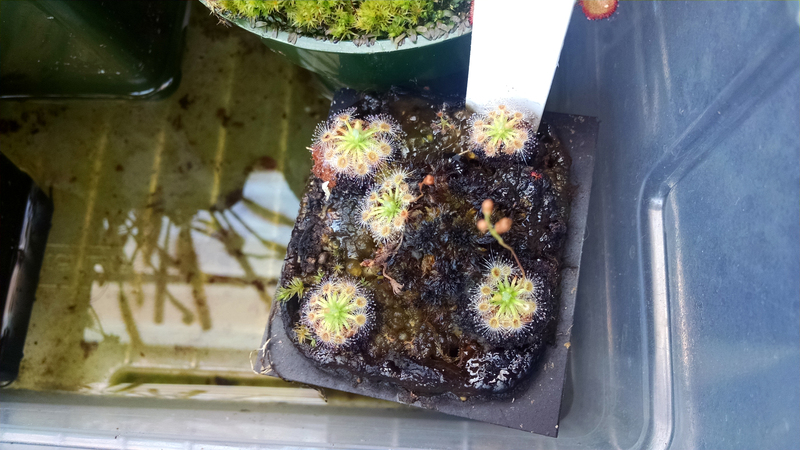 Let's start at the beginning, with my Drosera scorpioides. 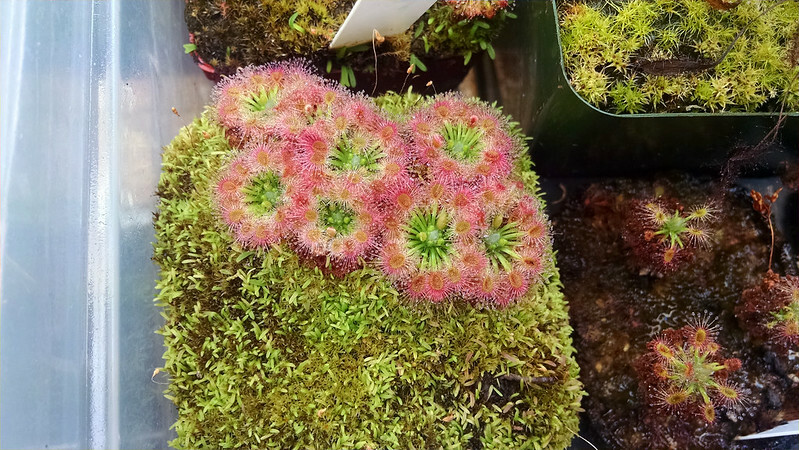 D. scorpioides is common, but that's mostly because it's a fantastic plant. The first photo is my main pot from the first pygmies I ever had, some D. scorpioides I started from gemmae last year. The consensus is that the black mounds are earthworm castings. Also I didn't harvest the gemmae from these guys because I just had way too much D. scorpioides gemmae this year. Hope it doesn't affect their growth too much. The second photo is the pot I got in the raffle back at the Spring BACPS meeting in 2014. They got hit hard with aphids, and are still in the process of recovery, alas. 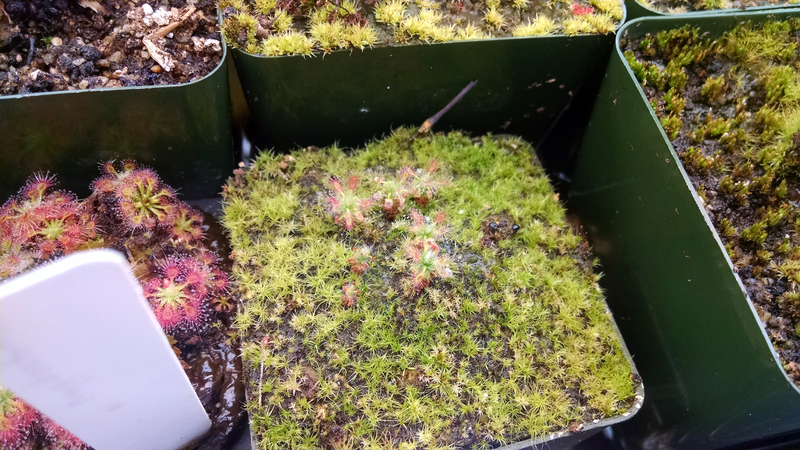 Now let's see what's up with the pygmies I got from Brie in the 2014 NASC auction: Drosera helodes, Drosera dichrosepala, Drosera pygmaea, and Drosera allantostigma. Later in the season the white color really comes out on these. These guys just keep trucking along in their tiny pots. These are all doing pretty well, except for the D. pygmaea, which is only barely hanging on. 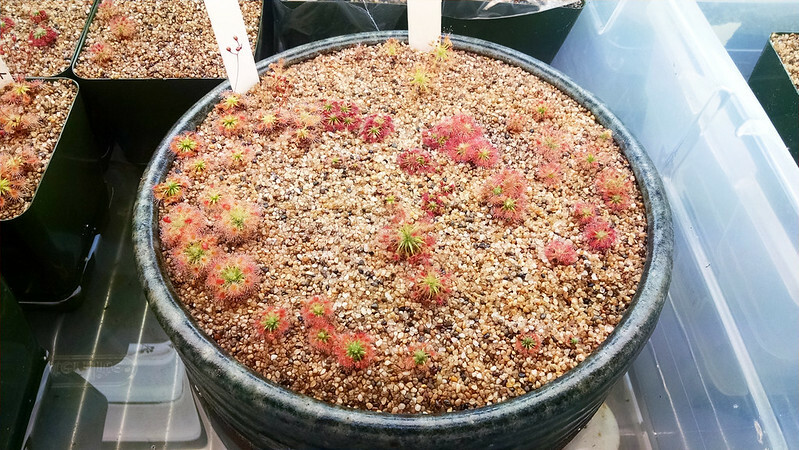 For some reason D. pygmaea does not do well in my conditions, which is strange since it's supposed to be a very easy pygmy. 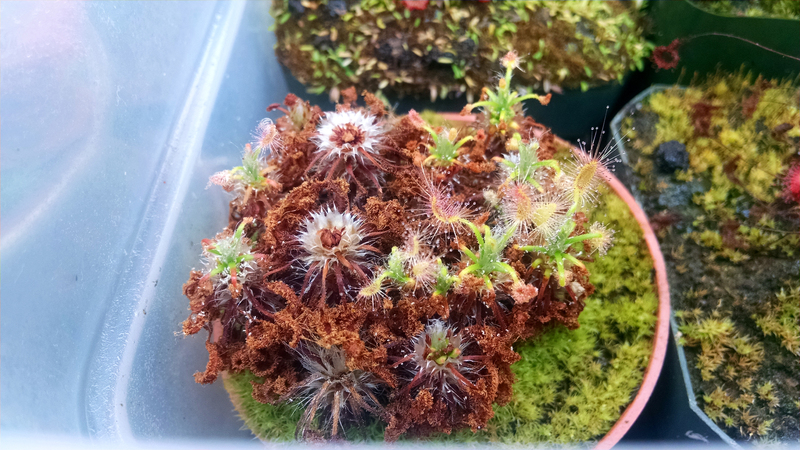 The D. allangostigma, as you can see, is clumping like crazy from the gemmae. Looks great. 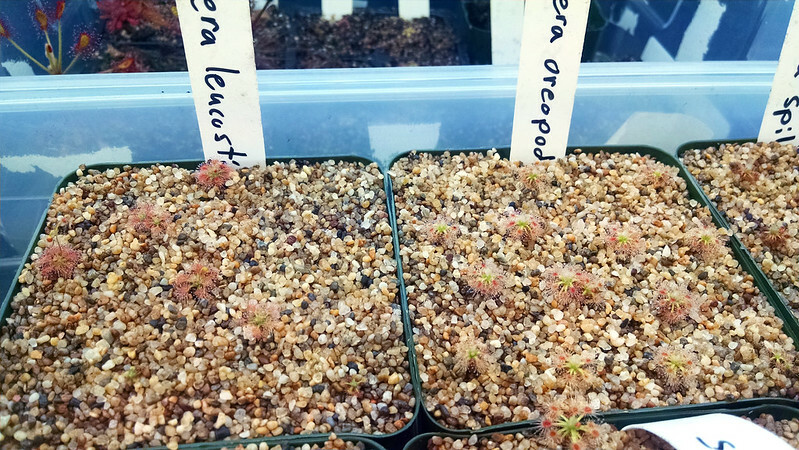 I've also got several pygmies I purchased from California Carnivores: Drosera callistos, Drosera enodes, and Drosera lasiantha. I can't wait until next winter when I get Christmas wreaths again. I didn't get to harvest any gemmae this season, darn. I keep waiting for these to take off. D. callistos looks fantastic (it's one of my favorite pygmies). A couple of the D. enodes didn't survive gemmae season, but the others are still lovely. For some reason the D. lasiantha has not been thriving. It's really just been sitting around not growing much. I can't really figure why. I've fed it a couple times but it hasn't seemed to make much difference. This is a pot of D. allantostigma I started from gemmae from Brie's smaller pot. They look like little gems. There's not too much to say other than that D. allantostigma is a beautiful plant. Finally let's get into the plants I started from gemmae myself this last winter. 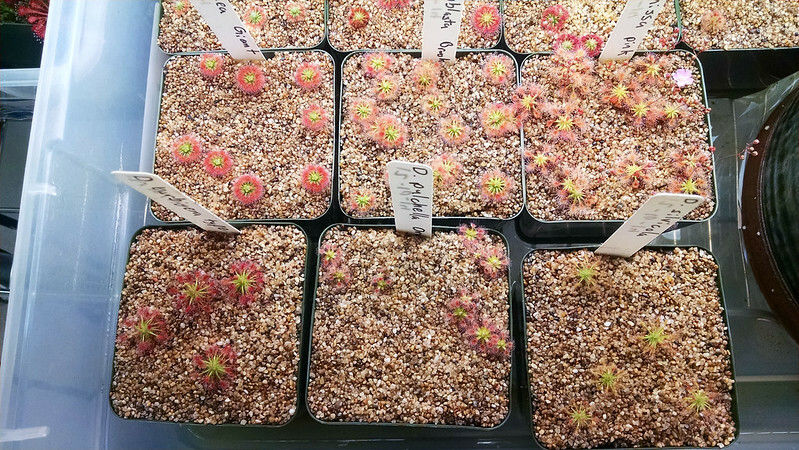 Most of these I purchased from Drosera Gemmae, which is the source for pygmy sundew gemmae in the States. 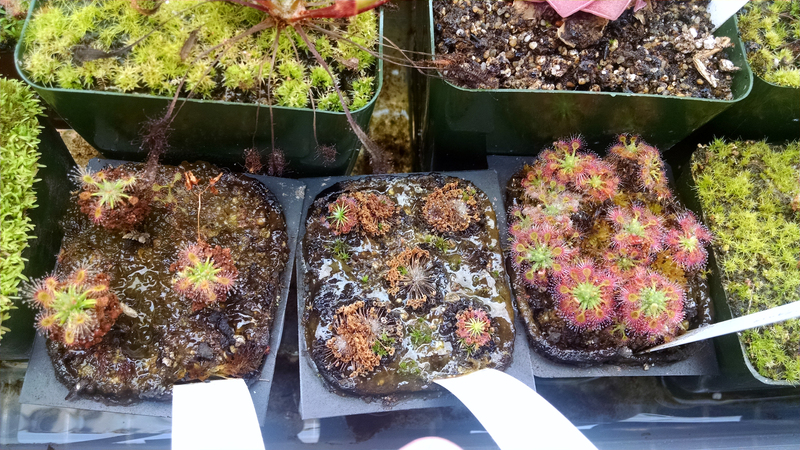 This first tray contains D. allantostigma, D. helodes, Drosera nitidula, Drosera leucostigma, Drosera oreopodion, and Drosera spilos. The first two species listed were sown from gemmae from my own plants, while the other four were from a late-season order with Drosera Gemmae. D. helodes doesn't show very well against the sand. I'm hoping they'll get bigger and easier to see. As you can see, the D. spilos reached a certain size and then crashed. I have no idea why. The D. allantostigma I harvested from my first, prized D. allantostigma, which – alas – didn't survive gemmae season. 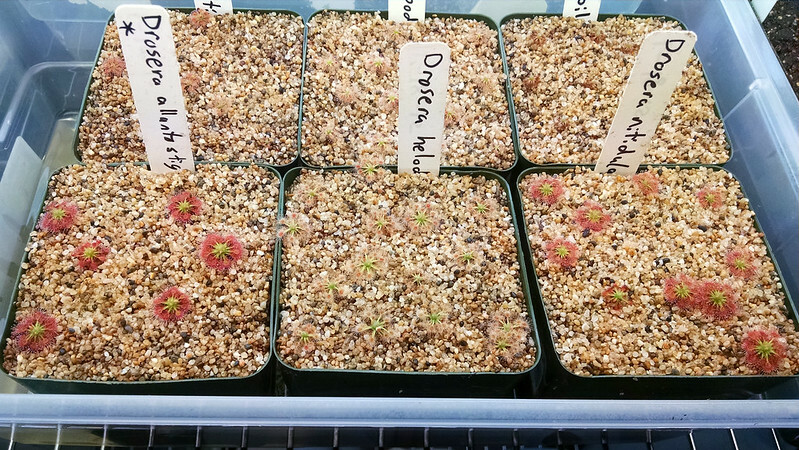 Finally, let's get to the Winter Batch, which was my big order of pygmy sundew gemmae right in the middle of the season. 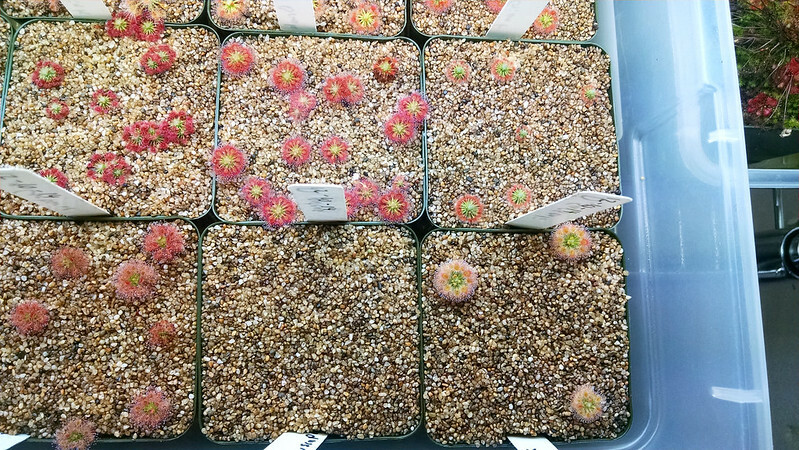 This first picture is (clockwise from top left) Drosera palacea, Drosera leucoblasta, Drosera omissa, Drosera silvicola, Drosera pulchella, and Drosera barbigera. This is a fine-looking group of pygmies. Of this group D. omissa is easily the most vigorous, but I really like the shape of D. barbigera – it looks like a tiny firework. D. palacea has great color and a nice, neat little shape. On the other side of the tray is 8 more species/hybrids, which I will list in the photo captions to make it a bit clearer. The leftmost four pygmy pots, clockwise from top-left: Drosera grievei (with one D. omissa hitchhiker), Drosera × Carbarup, Drosera roseana, Drosera pygmaea. 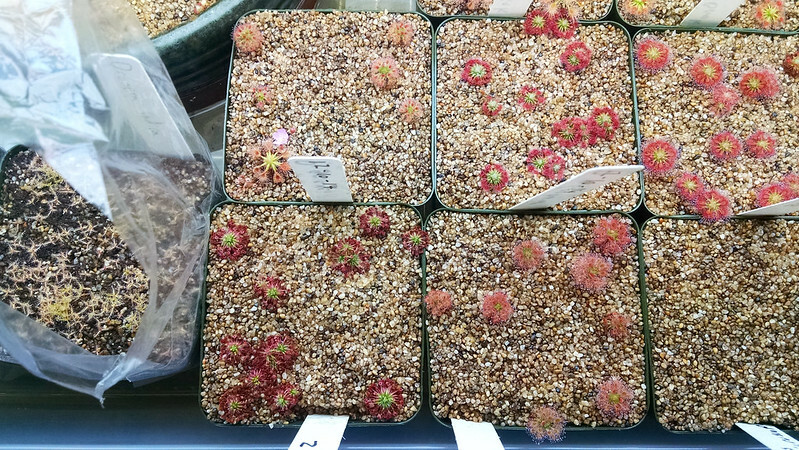 The rightmost four pots, clockwise from top-left: Drosera patens, Drosera sargentii, Drosera × Dork's Pink, Drosera occidentalis. 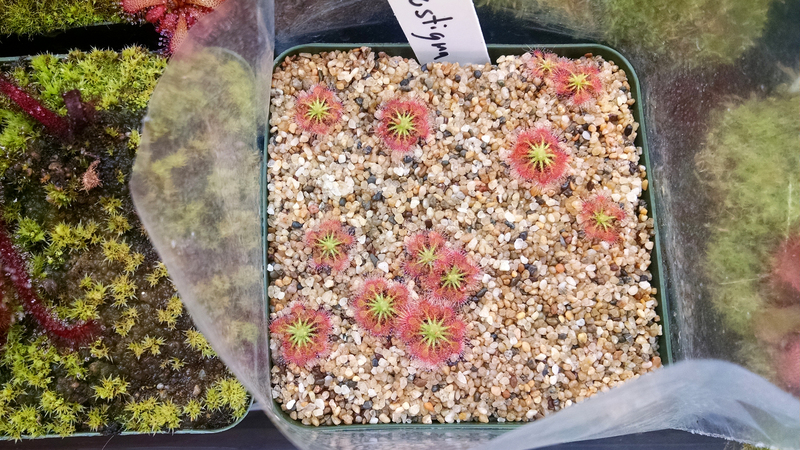 My D. pygmaea were looking really good for a while, but it seems they've gotten hit with the aphids. I hate aphids. D. sargentii has a really unique shape and profile, which I've really come to like. And D. × Dork's Pink is just a beautiful plant. 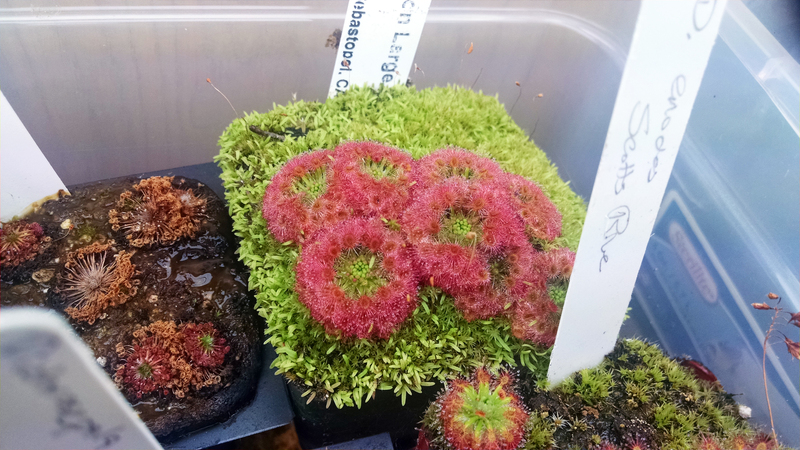 It looks like my D. occidentalis failed entirely, but that's not quite true – there is a bit of life in that pot. 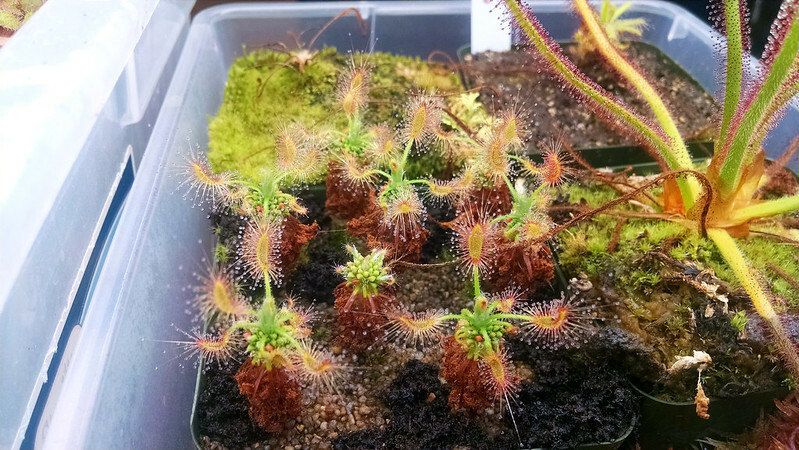 You may need to click the picture to see it, but there's a sundew in there. I don't know how well it will survive into next year, but at least I can hold out hope for more gemmae someday. So that's the spread of my species/hybrid-specific pots. There is one very special pot though – the Pygmy Garden. Looking like a proper garden now. It's filling in. I'm excited. I can't wait to see your lasiantha get bigger. I have to say my favorite pygmies are the ones that look like scorpioides, like lasiantha, silvicola, and gibsonii. I think D. gibsonii has my favorite shape in that group. It's a great-looking plant. Very cool! I like the look of the sand top dressing. 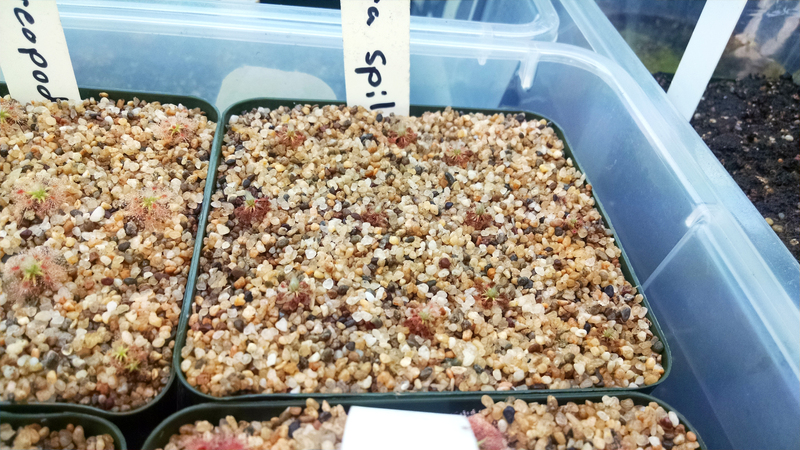 I like the top-dressing too, but I think in the future I might try to get a more uniform-colored sand to use for top-dressing so that the pygmies stand out more. I feel like a pure white or pure black sand would look really cool. How deep of a pot do you put your pygmies in? All of the pygmies I've started are in 3.5 inch pots. I do have some that I received from other growers that are in very small seed starting cells that seem to do fine though.